I just want to do what’s best – how do I know what speech & language information is reliable? “I am getting SO many different opinions about what to do about my Child’s Speech & Learning Development – Who should I listen to? In ONE day I’ve been told “Wait until they are older before you start worrying”; “You should have done something before THIS age!” “Go to the BLAH BLAH parenting site they have the best info”, “Don’t go to the BLAH BLAH parenting site because the people giving the advice are not experienced”; “My little Johnny was like that but it didn’t affect him”, “My child was doing that and they then had a terrible time at school”. With all this I just don’t know what I should do … I just want to do what’s best for him!, blurted a parent phoning SpeechNet Speech Pathology in complete and understandable frustration! Parent get advice from everyone even when it’s not asked for sometimes – from in-laws, other parents in the park, GPs, kindy staff – some of it is spot on and some of it is far from it! Where do parent turn to… In this time and age Siri, “Mr Google” and the like seems to be the first port of call for all manner of information. BUT how can you tell if the information you are directed to is reliable? There are a few things to consider when you are looking for information, tips and ideas as a parent wanting only the best for your child: HOW can you tell if a website is reliable? Many people rely on looking for sites that clearly say they are “specialists” in an area or look for reviews by other parents or star ratings on websites or Facebook pages. HOWEVER this is problematic if you are looking for recommended Speech Pathology sites. Why? Speech Pathology websites or Speech Pathology Social Media outlets (Facebook, Instagram, Twitter etc) CANNOT use words such as “specialists”, “specialising in” OR have client testimonials or reviews to give you some guidance. The guiding body of the Speech Pathology profession, Speech Pathology Association of Australia have strict policies in place disallowing these “marketing” techniques by registered Speech Pathologists. The goal is to ensure Speech Pathology practices do not falsify information to the public reducing the reliability of the information disseminated. Is the website directly linked to a certified speech pathologist or does it have a consulting speech pathologist clearly identified for the information provided – this can be the Blog author information tag, details in the “About Us” menu tabs or staff information pages on the website. Look for websites that clearly identify who is giving the advice – reputable sites will have staff profiles with credentials listed. Speech Pathology in Australia is a 4 years university degree as a minimum and the degree focuses on Development and Disorders of Feeding, Communication & Literacy. Therapists with a Bachelor or Master degrees in Speech Pathology will indicate this by the letters after their names (e.g Athena Panagopoulos, Speech Pathologist, BaSpPath, MSPA, CPSP, SpeechNet Speech Pathology. Is there is any evidence that the staff giving the advice have sufficient experience to be giving information on the specific topic you are investigating e.g., years of experience, post graduate qualifications such as a PhD (e.g., Dr Sandra McMahon, Speech Pathologist, B.App.Sc.(Sp.Path. ), PhD, MSPA, CPSP, Director of SpeechNet Speech Pathology), professional research papers published in the area (e.g., website linking to publication lists). Does the speech pathologist indicate they are a member of Speech Pathology Australia (MSPA) and also a CERTIFIED PRACTISING MEMBER of Speech Pathology Australia (e.g CPSP)? To achieve this tag after their name the Speech Pathologist has to prove to Speech Pathology Australia that they have kept up to date with the latest research and practises of the profession every year. This ensures that after graduation they did actually work to get experience and have stayed abreast of new concepts and techniques in the profession over the years. Another way to see experience can be to see if they have been invited to present at Professional seminars or conferences which demonstrates that their experience and skills are respected by the professionals in the area. Parents also want to know that the professional is working with their “whole child” and not pulling out one problem in isolation. Many factors can work together (e.g., behaviour & language which may require child psychology & speech pathology; problems chewing & coping with sensory factors of taste, touch & smell which may require an occupational therapist & a speech pathologist; or low tone and motor difficulties impacting on attention requiring a child physiotherapist & speech pathologist). Speech pathology sites that link or indicate they have experience to provide trans-disciplinary or multidisciplinary practises can be very beneficial. Look for up-to-date information – many websites are not updated and a lot of parenting information should be up-to-date, such as available parenting programs in your area, schooling information, etc. Can you communicate directly with a speech pathologist without it being a costly experience? Sites with a means of emailing or skyping a speech pathologist directly can mean you are getting information direct from the “horse’s mouth” and not second hand (e.g., a contact us page plus a quick email contact window or a booking request close to every page of the website). Sites that not only give information but very clear options & activities that you can follow-up on are also very valuable so you can get started supporting your child immediately. There is a lot of good information out there but unfortunately there is also a lot of miss information – thinking about who and where the information is coming from can help you in your choices …….so you can provide the best for your child or the children you are working with! SpeechNet Speech Pathology is dedicated to provide quality professional information that is functional and useful to families and other professionals. 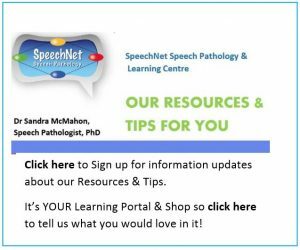 SpeechNet Speech Pathology & Learning Centre aims is to provide YOU with a website and a Learning Portal that gives YOU what you want and need to help the children in your life. Our goal is for two-way communication with the public about what they need. If there are resources, information or activity ideas you would like to see on our website contact us or the link Our Resources & Tips for YOU link and tell us what you need. Author: Dr Sandra McMahon, B.App.Sc. (Sp. Path. ), PhD Certified Practising Member of SPA. Director of SpeechNet Speech Pathology & Learning Centre a multi-disciplinary allied health services that support families of children 0-18 years. Dr McMahon has had over 15 years research & Clinical experience in paediatric speech pathology, was the Director of a major Metropolitan Tertiary Hospital, was a University Lecturer and has presented at many Parent (Multiple Birth Association, Infant Reflux) and Professional seminars.